Blog - Welcome to Bear River Outfitters! My name is Charlie Jennings. I am a Gear Pro with Bear River Outfitters. I would like to tell you about some of the products we carry, and would like to tell you why they are the very BEST of their kind. I first found out about Valandre' at the Outdoor Retailer Show in Salt Lake City quite a few years ago. Valandre' had a tiny booth and they were spotlighting their Shocking Blue sleeping bag. I observed that Niels, the owner of Valandre' was very meticulous about his design, and his bags were different (and still are) than any other bags on the market. Niels allowed our company, Bear River Outfitters, to become an authorized retailer for their products at that time. Bear River Outfitters was one of the very first U.S. Retailers for Valandre' Gear, and I believe that we know more about the detail of Valandre' gear than any other retailer. What makes Valandre' different? First of all, they source their goose down just a few miles away from their factory in France. They are able to go in and get the very best (creme de la creme) goose down. The most mature fatty grey goose down. Based on comparison, it's gotta be in the 900 fill range. I believe it is higher quality goose down than what other companies are using here in the U.S., and it shows. Other bags with similar fill I will get chilled in, but I have never gotten cold with Valandre' bags or jackets. Plus, other companies source their down from Eastern Europe or China, and it is just not as mature as what Valandre' gets. Plus, they pack it wet and ship it over the to U.S., and then fluff it up when it arrives. I'd rather sell gear to my customers that gets their goose down like Valandre' does. The down doesn't get so "worked over", if you will. Check out Valandre's site where he discusses the origin of the goose down. You'll be a believer like me. Valandre' does not scrimp on quality. And Niels is a perfectionist when it comes to design. What's different about Valandre' gear? The Shocking Blue and the Mirage have anatomically shaped baffels. Instead of straight ones. Why does that matter? Because in a climbing bag, every ounce counts. Valandre' bags drape over you. 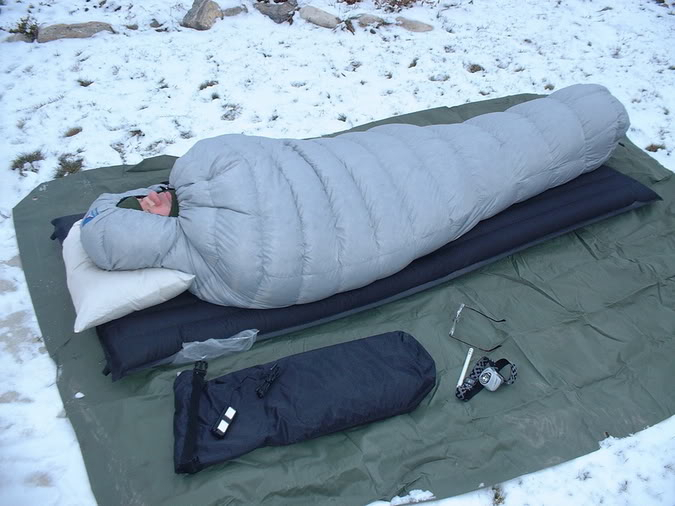 Climb in one and your body temperature inflates the bag like a hot air balloon. You do not feel the weight of the bag on top of you. Don't believe me? Try one out! The Shocking Blue and the Bloody Mary have the Marie' Antoinette collar that seals in the body heat. No other bag from any other company has this feature. It is quite unique and it really works. Me and my two sons were stuck in a March storm years ago up in Logan Canyon in Northern Utah. It turned out to be the coldest night of the year. The night cleared off and the temps plummeted. I pulled my Kestral weather meter out of my Mystery Ranch backpack the next morning, and it showed the outside temp had dropped all of the way to -21F. I had spent the night in my Hilleberg Nallo 3GT with my two sons. Fortunately, we all stayed warm. I was sure grateful for that Marie' Antoinette collar and my Shocking Blue. Not sure what the temps were inside the tent, but I never got cold. And it turned out that I was severely dehydrated that night. I took the Mirage out, without a tent, and had two thermometers with me. The next morning, the thermometers both had a minimum reading of 12F! How's that for a 1.5 lb bag! I was only wearing a base layer and a balaclava, and I was comfortable all night long.